Louisa finsished her first skirt which she made on a sewing machine! Great job, Louisa! Tuesday morning I had to go back to the Doctor for that issue related to my celiac disease. It was not a nice trip. Everyone who drove that morning knows why. We had 1/4 inch ice all over everything and I left the car outside. The clinic in Fosston is 30 some miles away. It took an hour and a half to get there. I planned on an hour. After I arrived I got right into an exam room. But the doctor was called on to deliver a baby. He came back a while later, "Ten pounds!" I'm not going to complain too much about my pain after hearing that. The trip home went faster because most of the ice had melted. Working on sermons. Willy's funeral is Sat. 11am at Nazareth. I have church at Mt. Olive at 9. I'll have to rearrange saturday school and confirmation that day. Please keep Willy's family in your prayers. Wednesday had to go to TR in the morning, then sermon stuff in the afternoon and Wed. School. Several phone calls in the evening for funeral service planning. 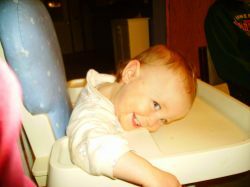 I got a good snapshot of Sophie working at the table. I just liked this photo of her, so I threw it in here. Thursday: mostly sermon prep. for both the funeral and for regular church. I'll have to do the bulletin for the funeral tomorrow. Aside from the meal I described on the actual day of Thanksgiving, Mary made a very nice dinner (evening meal, this time) on the Monday after Thanksgiving weekend. This all took place after my visit to Willy and Mavis. It was supposed to be Turkey, but there was a bit of a technical problem with that. So we had baked chicken breast, and very nummy, with sweet potatos and gluten free pie- 2 kinds, lemon something or another (way yum), and pumpkin (yum, yum). 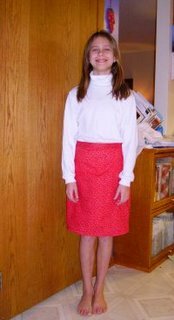 Unfortunately, Mary had a sinus cold going on so she could barely taste anything but salt. The meal made Stella happy too. But everyone wanted the pies. John helped with the pies. He really likes helping with desert. 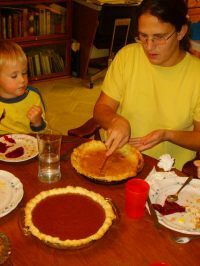 You cant see it in the photo here, but there are two finger streaks in the top of the pumpkin pie where John tried to help earlier, before the meal. About the turkey: Well, we bought it on 11/24. The label said "Use by 11/27." Early that morning on the 27th Louisa opens the turkey and says: "Eew, is there supposed to be green juice coming out of this?" Mary says, "Joe, my nose isn't working well. Does this smell good to you." Joe walks over-they always ask me to check with my nose. The reason is not that I have a better nose. The reason is that I'm too stupid to see that they have a more highly developed survival instinct. Joe, the probiscus without a brain, thinking "what silly girls, they get grossed out so easily" comes over exhaling deeply, places his nose next to the greenish turkey juice and, regretably, inhales deeply. "I don't know, it does smell a bit off." Translation: "Whoah, I better not let them see me turn green. After all, I'm still the man of the family." "Let me get it unwrapped, perhaps it's just odd here." Fumes fill the kitchen. The skin of the turkey sloughs off when touched. Uncouth, murkey, and foul smelling juices fill the pan in the bottom of the sink. "Perhaps if I just wash it off." Louisa watches at a olfactorially safe distance. I rub the bird under cold water. More skin sloughs off. I trim off the limbs that have a greenish hue. "I don't think we should eat it. Just to be safe, you understand." We're all more relieved to get the smelly thing out of the house than we are sad that we don't get turkey. I drain the pan with the bird in it. Put my coat on and carry the corpse out, far out to a safe biohazard disposal site. Remember that kid in "A Christmas Story" who stuck his tongue on the flagpole? That's what happened to my fingers with the pan. It wasn't hard to get them unstuck. I did dispose of the bird. While it had frozen to the pan a bit, it came out fairly easily. I soaked my sore smelly hands to get them warm and then scrubbed them raw. It took bleach to get the stink out. 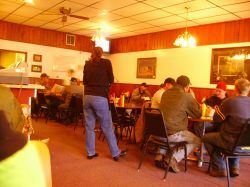 As I mentioned in a previous post, our Winkel was held the monday before Thanksgiving at Our Savior's in Hawley. I completely forgot to get a photo of the outside of the building. 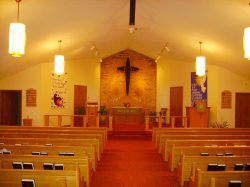 But here is the worship area. The dining hall might seat around 130 people or so, maybe? They have a nice kitchen and a good entrance area. Pastor Chris Dale serves this congregation along with Calvary in Ulen. I've a bit of backstory to give. The weekend before Thanksgiving my parents came to visit. The kids were singing in church at Oak Park that weekend. 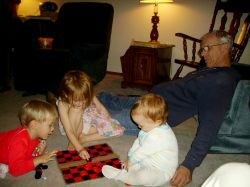 Dad tried to teach Stella, John, and Sophie how to play checkers. For the most part they did quite well. Mom got involved in taking some pictures of Stella. But Stella wouldn't stand still. It was fun to watch Mom try to focus on Stella. Stella was so interested in the camera, as soon as she saw Mom trying to take a picture she'd run right up to her Grandma and grab at the camera. Some of those photos should prove fun. Thank you very much for coming that weekend. We had a blast. And thank you for the birthday present. I've got it working. I'll have to practice a bit and set the blade true. But it is a very nice saw. Thank you. Saturday Mt Olive services, Saturday School, and Confirmation Class. Then home for dinner. After dinner another Confirmation Class. I've had a couple of people ask me about this second Confirmation Class I hold on Saturday. Here's the deal. I do a private session with one family who are not yet members. It's instruction for the whole family, but especially for their eldest son. He has a form of high functioning autism. That means that he can communicate and reason clearly. The problem is that his mind is so blindingly fast that he's on 10 to 15 subjects all at the same time. He has no problem speaking about and thinking about all of them at the same time. He can keep them clear, but the rest of a class of kids his age can't keep up, and so it is difficult to keep a larger class on task. But it's not bad with him and his family together. And we're making great progress with the lessons. Sat. eve I went to Grand Forks for an emergency hospital visit. Willy Good has pneumonia bad. Randy called me just before supper time, I took Matt with me. Willy was possibly aware of us. One of Willy's family members was there. I read from the Psalms, prayed with Willy a prayer of confession. I read from the Gospel of John chapter 20. Matt and I sang "Away in a Manger." We prayed for Willy and I gave him the Aaronic Benediction. We visited for a short while. Then Matt and I went out for supper. We got home late. Sunday, three services. I don't have the CDs ready for Naz, St. P. or Oak P. Sorry. I've been having a difficult time with a health issue related to my Celiac Disease that is causing quite a bit of pain. This started Friday morning and makes certain movements extremely painful. Sunday evening I got a call that Mavis has pneumonia and would like me to visit. Monday sounded good to her. Monday, I went to Grand Forks to see Willy. He's doing very poorly. Kelly, Brenda, and Yvonne were there. Yvonne spent the night. We had devotion with Willy. He's not responsive, but that doesn't mean that God's Word is ineffective. We prayed and read from Luke 2, Luke 26, and 28 about the Gift God gave to Willy and us in Christ, we prayed corporate confession and absolution, the Lord's Prayer. Yvonne and I sang "Children of the Heavenly Father" and I pronounced the benediction. Kelly, Brenda, Yvonne and I talked for a while. I left about noon. Willy died just after 1:00. Erling Johnson (the funeral home guy) called me that evening to let me know. The following is a quotation from Pr. Christian Anderson's 1927 address to the synod which he entitled "The Doctrinal Position of the Norwegian Synod"
The ELS republished this essay for synod-wide distribution. It will be necessary to consider briefly the doctrines for which the Norwegian Synod contended during these years. The first conflict arose among the Norwegian immigrants concerning lay preaching. Before the arrival of the first regularly ordained pastors from Norway, Elling Eielsen and other lay preachers had conducted religious meetings in various settlements. This fact in itself is not to be censured. On the contrary, it was very desirable that the word of God might be preached among the scattered pioneers, who, in some instances for a long time, lacked the established office of the ministry. But these lay preachers had not from the homeland acquired a clear conception of the truth of the Gospel, and they became still more confused by coming in contact with the Reformed churches in this country. These lay preachers assumed a hostile attitude toward the ordained pastors when these attempted to bring about order in the church work. They wished to continue their activity throughout the settlements even after regularly organized congregations had been established. There arose a bitter conflict in many localities. The organizers of the Norwegian Synod endeavored to inculcate the true Scriptural doctrines of the Church and of the office of the ministry. They held that everything is to be done “decently and in order” in the church of God. The local church is a divine institution. God has entrusted to it the office of the keys, which functions through the preaching of the Word and the administering of the sacraments. The local church alone has the right and the duty to appoint pastors and teachers. Only such teachers are to he appointed who have been tried and found competent according to the requirements that are very clearly defined in the word of God. No individual has the right to usurp the authority which rests with the local congregation alone, on the plea that he has received a direct call from the Lord. Only in cases of special need are others then properly tried and appointed teachers warranted in preaching the word of God publicly; and even in such instances those who are ministered to should extend a call to these workers, if they are at all capable of doing it. This position of the Synod does not militate against the Scriptural doctrine of the spiritual priesthood of all believers. This spiritual priesthood may and ought to function to its fullest extent without conflicting with the divinely instituted office of the ministry. For many years this position of the Norwegian Synod was assailed not only by these pioneer lay preachers themselves, but also by all the other Lutheran bodies that were later established in opposition to it. These synods have continued to defend lay preaching, more or less, up to the union of 1917. In the course of these controversies concerning the Church and the Ministry, the view held by the Norwegian Synod regarding the true relation between the local congregation and the synod, as such, gradually became well defined. God has instituted the local congregation. He has entrusted to it the Office of the Keys. No individual, or any group of individuals, has the right to exercise authority over the local congregation. God has not instituted the synods as such. We find in the Scriptures no trace of such an organization. Synods have come into existence because the congregations have voluntarily agreed to enter into such mutual relation. The congregations are thereby enabled more easily to work together for the training of pastors and teachers, for carrying on missionary activity at home and abroad, for Christian benevolences, etc. The synod thereby becomes only a medium which makes it possible for congregations of the same faith to function more energetically and efficiently in matters of common interest. That this was the position of the Norwegian Synod is brought out very clearly in the revised constitution of 1866, which stipulates that the Synod may only exercise advisory authority with respect to the individual congregations; Synod has no right to dictate policies or rule over the congregations. The following quotation from President Preus' synodical address for the year 1865 shows how carefully our fathers sought to protect the rights of the local congregations: “The congregations joining to form a church body, and adopting a constitution, should be very guarding indeed, in freely relinquishing, in part, their liberty and independence, doing so out of kindly solicitude for their own and the common welfare, lest they delegate to the Synod or general body any rights and powers which the Lord solely has entrusted to the congregations themselves, and which, when exercised by them, offer the best guarantee as to the preservation of the true faith. To such rights and powers belong, for instance, the appointment and dismissal of teachers, exercise of church discipline, the adoption of hymnals and text books for the schools. Much less ought the congregations assign to the general church body or its officers any power and authority by virtue of which their resolutions — even when not in conflict with God's word — could be construed as laws binding upon the congregations by virtue of divine authority, vested in them as superiors according to the fourth commandment. Such concession on the part of the congregations would make of the synod a papacy which might become just as anti-Christian as that of Rome. It would subject the congregations to human authority and place a yoke upon them much more intolerable and more difficult to remove than that which state churches impose on their congregations.” Among the Norwegian Lutheran church bodies, the Synod alone held this position. The Lutheran Free Church has, in spite of much talk about the independence of the congregations, by the absence of order in its organization, given the authority into the. hands of influential individuals and groups instead of guarding the liberty of the congregations. Thus far the quotation. For any parish members, I can print this brochure for you. I should note that the bold and italics emphasis were added by me. I hope that readers can recognize the special importance of the claim of authority based on the fourth commandment. If there is obedience due to any authority on the basis of the fourth commandment, then the one who is claiming such obedience is claiming that his authority is divinely given, rather than a human arrangement. Once a congregation grants "divine" authority to a synodical official, then we have already placed a yolk of the old papacy around our necks. Hey, Joe! Long time no post! Yeah, I know. But let me plead with you, my family. I had 8 services to prepare for, a few shut-in visits, a winkle, and a couple of hospital visits. All in all, I've been a bit busy since the 15th. So, Saturday was church at Mt. Olive, with saturday school class (3 in attendance) and a confirmation class (4 in attendance). Both of which are going well. 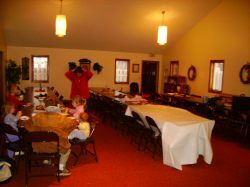 I introduced the Christmas program and handed out CDs with the memory work and music. This will let the little ones, who can't read really well yet, listen to their parts with the music. I gave the CDs to the big kids too. I figure they can use it on the school bus and wherever else. Hospital visits on Fri and Sat. One which I can mention is Ragna. She's suffering from shingles. Matt came with on the visit. I got to several, but not all of the TR shut-ins this past week. I hope to get to Grygla this coming week. Man, time goes fast. December is just around the corner. Monday we had winkel in Hawley. I hadn't been to Our Savior's in Hawley before. It's a very nice building. I presented a study on Closed Communion that I'd written last summer. Our Christmas winkel is scheduled for the third monday in December at Lengby. After which we'll have our Christmas dinner at the Fireside. Tues I tried to take a day off, but ended up making some phone calls and doing some sermon work. There isn't wed school this week. I'm glad I scheduled it that way. There just isn't time to do everything that needs to get done. Wed afternoon I started developing a migraine. It lasted until late Thurs afternoon. I've also got another stupid health issue that I will probably have to see a doctor about. It's a boil that causes considerable pain and prevents me from being in one position for very long. Maybe that's too much information, whatever. I did go to the chiropracter on Monday. That helped with the rib quite a bit. Now, thurs eve, I'm feeling the rib bruise quite a bit. for all which I owe it to Him to thank, praise, serve, and obey Him. So, how was your thanksgiving meal? Here's what I cooked for noon today. I boiled the potatos and used the potato water as the base for the oyster stew. I also browned some butter in sauce pan. Browned butter is a wonderful thing. You need to do it on low heat over a long period of time so that nothing gets burned, but oooohhhh the flavor. I took some of the browned butter and put it on the mashed potatos. The rest I put in the oyster stew. For the steaks, after I opened the oyster can I poured the juice on the steaks while they were broiling. What a nice flavor. The mixed vegetables? Well, I put them in a microwave dish and nuked them. Nothing too creative about that. But Stella loved them. Now, for the oyster stew. This one was a wonderful gift of providence. I made it up as I was cooking. Here's how I did it. First, I took the potato water from boiling the potatos. I added an equal part of milk. I added some, but not a lot, of butter. I put the oysters in. I sauteed onion, carrot, and celery together. After the sautee had started to brown I added pine nuts to the sautee. When those browned I put the whole thing into the pot for the stew. I reconstituted some dehyrated shiatake mushrooms with a bit of Cavender's Greek seasoning salt (lightly). And then I added the mushrooms. When this began to simmer I added the toasted butter and a bit of black pepper. Yum, Yum, Yum. I know that not everyone likes oysters. For some of those who don't like them this would sound totally gross. But we liked it very much. It's hard to go wrong with a stock base of sauteed onion, carrot, and celery. Someone remind me some time to put up my recipe for candied onions. It is also a wonderful thing. O Lord, give us the Spirit of Your wisdom and love! James 3:13-18 Who is wise and understanding among you? Let him show by good conduct that his works are done in the meekness of wisdom. But if you have bitter envy and self-seeking in your hearts, do not boast and lie against the truth. This wisdom does not descend from above, but is earthly, sensual, demonic. For where envy and self-seeking exist, confusion and every evil thing will be there. But the wisdom that is from above is first pure, then peaceable, gentle, willing to yield, full of mercy and good fruits, without partiality and without hypocrisy. Now the fruit of righteousness is sown in peace by those who make peace. Because the devil's very nature is pride, we are all by nature vain, conceited, proud, and self-willed. No one is born meek and gentle. But some are wiser than others in their own eyes. When such people struggle with spiritual awakening, then God's Spirit indeed can humble them and God's chastisements can keep them humble. But in general, sooner or later they will come forward with their wisdom toward dividing the brethren. They think that only they have eyes to see the defects in society. They feel called to improve the church, and their wisdom breeds "envy and self-seeking, " tossing about from one thing to another, "confusion and every evil: thing." Such people are not easily persuaded; they know it all. They appeal to the example of our Lord Jesus, to Paul and Luther and other men of God: that they too separated themselves and established their own group. O if they knew the living spirit of fellowship of the Lord and His holy followers and if they felt the deepest pain over "being rejected," then they wouldn't accuse them of being sectarians. They say that for conscience' sake they cannot bear the breach of fellowship. What a sensitive conscience! If they took the sins of their people onto their conscience with Christ's love, they would have something to do besides cultivating bitter roots that cause confusion. "Do not boast and lie against the truth." This is no; "the wisdom that descends from above" for "that wisdom is pure," no: mixed with the devil's spirit of pride. And it is "peaceable," uniting gathering what is the Lord's, in the bond of peace. Furthermore, it is "reasonable ... gentle, willing to yield." It "gladly speaks," willingly listens to others, gives truth its right and is willing to be corrected. "1: is full of mercy and good fruits." Listen to that: "full of mercy and good fruits, without partiality and without hypocrisy," righteous, sincere, and upright. Whoever has this wisdom sows peace and reaps blessed fruit in this world and the next. God, help us that none of us hold back from Your grace. Let no bitter root grow up and create confusion, so that many are harmed by it. Give us the wisdom from above, and let us by good behavior show our good works in wisdom's gentleness. Amen. And mars a truly Christian life. Where concord and good will shall reign. At 11:14 Universal Time Clock today there was a eartquake measuring 8.2 in the Kuril Island region. I had no idea where this was, looked it up. It's the string of islands between the north of Japan and that big thumb of Russia which sticks down by Alaska. Tsunami warnings were issued throughout the Pacific Ocean costal regions. Evacuations began. And, it is better to be warned and safe. The Christmas tsunami in the Indian ocean a couple of years ago taught that lesson fairly vividly. [F]or several tense hours, communities along Hokkaido's northeastern shore braced for larger waves, with thousands fleeing the coastline for higher ground. Fishermen scrambled to secure their boats, police cars made rounds of deserted piers, and ad hoc evacuation centers were set up in schools and town halls. Masayuki Kikuchi, a town official in Nemuro, in Hokkaido, said the city dispatched about 20 fire trucks and cars immediately after the tsunami alert to instruct coastal residents to evacuate to higher ground. "There was no panic," Kikuchi said. "Residents made their way to high ground, just like they do in our annual tsunami drill." The first wave was recorded at Nemuro port on Hokkaido hit about 45 minutes after the quake struck, but was estimated at only 16 inches. The waves got progressively smaller, though the agency said one measuring 23 inches hit Tokachi port in south Hokkaido almost four hours after the quake. All tsunami alerts and watches were called off at 11:30 a.m. EST. 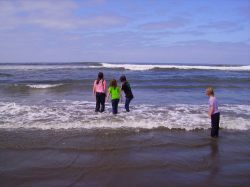 I'm pretty much land locked, but I have been to the Pacific Ocean several times. I'm not sure how one could measure a 16 inch tsunami. 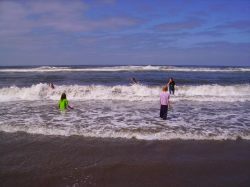 Most of the normal waves that come in when I've been to the Ocean are WAAAY bigger than that. 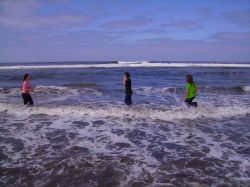 These photos are a series of shots of our kids with Joel and Kathy's kids at Ocean Shores last summer. More work on the Christmas Program CD, sermon/hymn planning, Wednesday School, and an OP LYS meeting before supper. Tomorrow I hope to finish Thief River visits. Friday, maybe Grygla? Monday I went to the Chiropracter in the morning and did some chores around the house. In the evening I spent a few hours working on a CD of the Christmas program to help some of the little ones practice at home. Tuesday morning visits in TR, groceries. I hoped to get a flu shot but the clinic was out. Darrow bumped into me at Hugos and told me that Thrifty White had flu shots, so I went and got my first ever flu shot. Does that make me no longer part of the young generation? I arrived home late afternoon, did some work on the CD and some sermon/hymn scheduling. OK, sorry about not posting in a while. It really was a long, and quick week. I posted last Sunday and now a week has gone by. So, what I can remember I'll do. First of all, Kristi, there is a photo of liver flukes at the end of this post. You may want to avoid looking at that one. I mention them here so you can avoid them, and because I found them last sunday evening when I was cutting up a deer liver. Dean invited me over to get some sinew for my bows. Over at his dad's place (i brought the 4 older girls with) we watched Dean cut. The girls watched me cut. And the girls helped Dean wrap the meat. They thought that the shed smelled funny. "Well, you haven't done this before, girls. This is where meat really comes from." "We know dad. We just don't like how it smells when you're doing it." A couple of years ago I brought the boys over to help butcher a lamb. They were kind of squeamish too. At least the girls didn't run off to play elsewhere. But then, they really couldn't. It was dark. The woods is alive with all kinds of critters around here. The big bad wolf lives here, as does "brother" bear, and the fierce cougar. Yes, cougar. There are tracks just a mile north of where we were that evening. It was the same when he got home. All the little heads looking out the window waiting for their heroic brother to return. Finally he arrives and is battered with hundreds of questions from all. Meanwhile, I had scraped one of my bow staves. Now to let it dry and do some others. I didn't get to the others. By the way, when scraping bow staves it's a good idea to use a "sharp" knife. It's a better idea to use a "large" sharp knife. The cut on the knuckle of my left hand is nearly healed now. Short sharp blades make for accidents. Tuesday I spent working on sermon planning and hymn selection. My celiac disease is acting up some more. We also have some kind of respiritory flu bug. The little ones have fevers. Mary and I have aches. Wednesday I spent mostly in bed. I took a celebrex, got a migraine. I had a lot of pain from the rib and back, but it was hard to tell if I was coming down with the flu bug that the kids have. Alison took my wed school class for me. I am grateful to you, Alison. The migraine didn't really go away, but it was less intense by about 8pm. Thursday I went to the chiropractor. I had thrown away the last of my celebrex. I'm not sure what's flu aches and what's due to my rib. But when I took a celebrex I got a migraine. The doc found the right joints to crack. AAAAHHHH. I still have the migraine fog in my head but at least I could spend the rest of the day working on sermon planning and hymn selection. Friday my celiac disease was acting up again-or maybe it's the flu. Not able to do visits with this junk. I finished up my sermon for Sat/Sun. Saturday my celiac disease was still acting up. I had church services, Sat school, and Confirmation class, but it was close. Mount Olive doesn't have indoor plumbing. 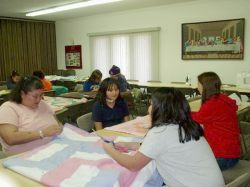 Meanwhile, at Oak Park, Alyssa was working with a bunch of volunteers to make blankets for project linus. Their handiwork is very nice. I don't know half the people in this photo. I hope Aly can write up something for the local paper about it. Thank you to all the volunteers. Celiac problems continued through the day. I wasn't able to do my second confirmation class. Sunday (Today) I asked Wayne to lead the Office of Prime and read my sermon up at St. Petri. My gluten reaction was too strong to allow me to drive all the way to St. Petri. Thank you, Wayne. I was able, with a few breaks, to hold services at Naz and OP. Later in the day my reaction wasn't as sever so I made up the confirmation class from saturday. The family gave us a kitten. They told me that I'd won a door prise. So the kitten, black with white splotches, is named Door Prise. Also, anyone squeamish might not want to read. For some readers this could be "Big gross factor" stuff. This final picture is from a week ago sunday night. Over at Dean's dad's place, Dean had saved the deer's liver at my request. I wanted to try it. Well, as far as I know I'd never had it before, so, why not. I got the liver out at home and washed it up. I noticed one of the lobes looked unhealthy. 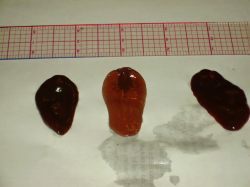 It had small parasites onthe bottom and was small and off color. The other two lobes looked great. I cut off the bad lobe and threw it. Now, as I cut through the main artery to separate the two larger good lobes a black crusty gunk washed out. Then I saw my first ever giant Deer Liver fluke. These lovely creatures are Fascioloides magna, the giant Deer Liver Fluke. I found three of these things. The ruler in the background is scaled in inches, yes, inches. Not those tiny little french centimeters, but good old American standards inches. And these specimens are not as large as these critters can get. They were plenty big for me. This fluke isn't dangerous to humans. But it's still gross to me. After photographing these, I scrapped the liver project and bleached my hands. Yeah, I am a wuss about some things. Perhaps next time, now that I know what to expect, the gross factor won't be so bad for me. But I know that if I find more in the next liver I won't find any one else in my household who would try eating the liver. 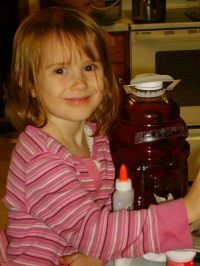 If I can get over the gross factor, maybe my kids will too? Kristi will never eat liver at my house if she's read this. Too bad, I can cook up a really nice beef liver dish. Attendance at Church is directly affected by Deer Hunting. We saw yesterday that the male populace practically diappeared from Mt. Olive. This morning there were some missing from St. Petri and Oak Park. But Nazareth increased dramatically. This gets at the heart of why so called "Church Growth" methods are contrary to the Gospel. There is nothing wrong with taking a weekend to go fishing, camping or hunting. And sometimes a lot of people pick the same weekend to do it because of some special event, like deer hunting. Their absence doesn't mean that they are despising God's Word. They'll be back next week for the same reason that they come the rest of the year, to confess their sins and to receive the forgiveness of sins; to be instructed from the Word of God, and to receive the Body and Blood of Christ. And just as it would be wrong to condemn those who absent themselves for hunting, so it would also be wrong to look at all those who came to Nazareth for the hunters' dinner and see some special virtue in doing this extra thing to attract people to church. A Hunters' Dinner is a nice thing to do, but it's not the reason that people will continually go to church. Most of those guests in attendance live far away and have their own home congregations. Their being here today was mostly based on convenience and a good time, not primarily because of the ministry of Word and Sacrament. But they did choose to hear God's Word rather than be out in the woods during that hour. I'm not slighting the guests in attendance. I am very happy that they chose to come to Nazareth to hear the Word of God. And I pray that God will grant His Holy Spirit to build them up in the true faith. 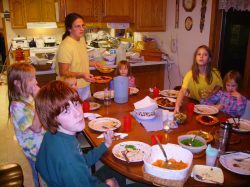 What could be dangerous is if people looked to dinners like this as something that builds the church rather than focusing on the Word and Sacrament through which God says He builds the church. A dinner like this provides excellent opportunity to introduce people to our congregation and the teaching of God's Word here, but if they are going to stay, it should be based on the Ministry of Word and Sacrament, not the great food. 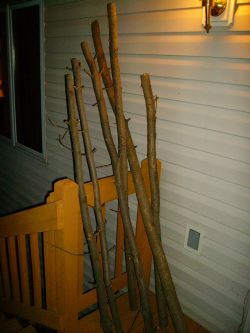 These are the ash poles I'm hoping to tiller out into bows. In a few minutes I'm going to head over to Dean's to get some sinew from a deer that he got this weekend. Some experienced bowyers will look at these staves and say, "man, some of them have a lot of knots." I know, but I need the practice if I want to make good bows some day. I'll try to put together a series of photos and steps I went through to make the bows. I'll put the failures up as well as the successes. That will help me to remember better. "Hey, what's that tin in you're back pocket"
OK, I'm off to cut some sinew now. Church at Mt. Olive today, we celebrated All Saints' Day with the text from Rev. 7. The little kids were all gone today (also the husbands-more on that below), so we had Confirmation class. Home at about a quarter to 12. Then, another Confirmation class at 1:30. In the late afternoon I did some more hymn and sermon prep for the coming church year. I'll try to explain what I do and how I do it. Perhaps some of you might have a helpful suggestion for improvement. After supper we had a visit from Dean and Naomi. They brought Clancy with them. Dean's going to save the sinew from his deer for me. I can use that in my bow construction project. He seemed kind of excited about it too. If it works out, I might teach a short course on tillering a self-made bow to the kids next fall at the Clearwater Shootout. I wonder what other things they might find interesting. Flintknapping would be cool, arrow manufacture, maybe even building fires with a bow and drill. We'll see. Deer hunting started in our zone this morning. That's why the husbands were gone from Church. We have our kids all stay inside during deer season. They've got their "forts" out in the CRP and in other locations in this quarter section. Unfortunately, they don't have the wisdom yet to not go out there during rifle season. So, we tend to keep them penned up in the house. We feel a bit safer that way. The first year we lived up here Mary went out for her morning walk and heard a few gunshots. Then she saw some orange coated men walking through the CRP. She realized then that she had her tan overcoat on. Not a fashionable color when everyone else is wearing blaze orange. So that week she borrowed someone else's blaze orange. Now she has some of her own. This photo is from last year. Pr. Stafford was given a blaze orange stole to use during the holy days of deer hunting season. Gathered around him are all the devoted hunters, dressed appropriately for these two special weekends. The photo was taken at the church at Ebro Corner. 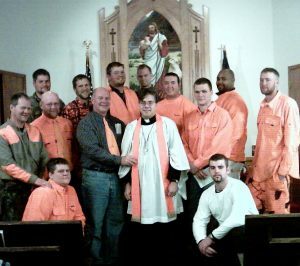 This year these men gathered again at Ebro for their special deer season festival service. Again, Pr. Stafford wore the blaze orange stole. 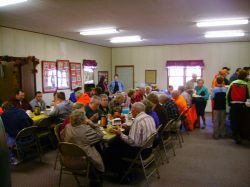 My congregation at Nazareth hosts a Hunters' dinner on the first weekend of deer season. I think I mentioned the Bear Hunt party that some of my members have when Bear season opens. Yes, hunting seasons are a big deal up here. We have "huge tracts of land" inhabited by large game. One guy was bowhunting deer earlier this fall only to have a black bear attack his deer stand. The bear would charge the stand and ram into it. The man didn't have a pistol or rifle with him. Pretty scary. But that's what getting back to nature is all about. Speaking of getting back to nature, do any of you remember Euell Gibbons? "Ever eat a pine tree? Many parts are edible" for that Grape-Nuts ad? Mr Gibbons was the back to nature spokesman of the 60s and 70s. He died in 1975 of a heart attack probably due to excessive inhalation of tobacco smoke. Incidentally, white americans are blamed for plaguing the world with the smoking habit, so here's a bit of history from http://www.tobacco.org. "Between 470 and 630 A.D. the Mayas began to scatter, some moving as far as the Mississippi Valley. The Toltecs, who created the mighty Aztec Empire, borrowed the smoking custom from the Mayas who remained behind. Two castes of smokers emerged among them. Those in the Court of Montezuma, who mingled tobacco with the resin of other leaves and smoked pipes with great ceremony after their evening meal; and the lesser Indians, who rolled tobacco leaves together to form a crude cigar. The Mayas who settled in the Mississippi Valley spread their custom to the neighboring tribes. The latter adapted tobacco smoking to their own religion, believing that their god, the almighty Manitou, revealed himself in the rising smoke. And, as in Central America, a complex system of religious and political rites was developed around tobacco." Today the political and religious rites and regulations are even more complex. Perhaps this is the real Montezuma's Revenge? It's ironic, anyway. Well, I started off with breakfast and devotion with the family, then to the office. Hmm. Was there gluten contamination somewhere at breakfast? Well, Alyssa's doing the bulletin and stuff, so I'm off to TR. By the time I was near the 7 Clans Casino I was pretty sure I was having a gluten reaction. I tried to park in the visitor's lot at the Hospital, but even the extra lot was packed. And now I knew I was having a reaction. A quick dodge into the library-thankfully there was parking. OK It's hard to do any visiting during a gluten reaction. So, I picked up some quick groceries, reacted again, and went home. "Other, less serious side effects may be more likely to occur. So, if I understand this right, though Celebrex is gluten free, the symptoms I have for gluten reactions are actually, ahem, "complemented" by common side-effects of the drug. Ya just can't win. I also noticed (Mary actually pointed this out by telling me to settle down) that since I don't feel the pain so acutely in my rib and back that I tend to play with the kids like normal and do my normal stupid stuff. This cant help the bruise too much. I'll try going without celebrex tomorrow and see how the rib feels. A little pain might make me more cautious and careful-as well as keep any gluten reaction from getting too much assistance. I had hoped to do some shut-in calls today. I'll do them Fri morning. There were quite a few phone calls I had to deal with today. I spent some time doing Hymn selection for the next church year. Nancy, I'll have the Thanksgiving hymns for you by this weekend. This afternoon Jeremy, Matt and I went out to find some Oak or Ash we could use to make some bows. We found several nicely sized young trees and brought them home. We didn't find dogwood or red willow for arrows. But we'll keep looking. After working through these staves we'll try doing some split staves from larger logs. Did some sermon prep tonight. OK, the night was bad, and unrestful. I don't go to the doctor very often. 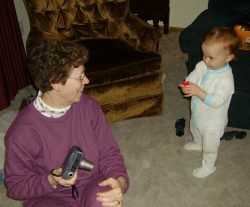 In fact, I've only been there when Mary's had a prenatal appointment or a baby to deliver. So I had to fill out the new patient paperwork. Jeremy came with to get his MMR, Tet., and HepB boosters. The doctor checked me over and decided I should have X-rays. Back in his office after being irradiated he told me that I didn't have a tumor, I didn't have gall stones, and no broken ribs or cracks that he could see. However, I did have a pretty good bruise. He said this could take half a year to a year to heal up. "Take it easy." Yeah, OK. "Try this." What's this? "Celebrex, 6 days worth." I have to say Celebrex works very well. And since the only serious side effects are massive heart attack and dropping dead, or severe internal hemmorage and bleeding to death, I'd say it's a pretty good trade off. 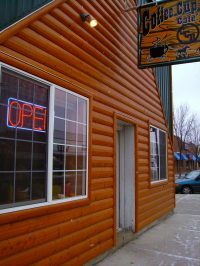 The photos are of the only restaurant in Fosston that I trust to cook gluten free. It was named the Coffee Cup Ranch, but recently it changed hands and I can't remember what the new name is. I took some photos that remind me of those bad photos in National Geographic. You know the ones where the people are blurry and the lighting looks like it's all golden and antique. Anyway, the cook and the staff are very responsible about cleaning the grill and making sure there is no cross contamination. If you have Celiac Disease and are in Fosston, this is the place. Don't eat at Uncle Bob's or at Palubikis. Palubikis can't keep from cross contamination, and Uncle Bob's is just pathetic. One Winkel we went to Uncle Bob's for dinner (that's noon in the midwest). 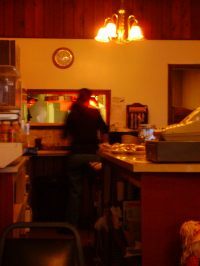 I talked to the waitress and the cook, explained that I couldn't have bread or anything with food starch or anything else made with wheat, barley, rhy, or oats. "If you're willing to keep it free of these things, I'll order, otherwise don't worry. I'll just sit with my friends." "No problem! We can do it." I ordered a steak and a baked potato. The waitress brings it out with a bun sliced open on the steak. I said, "I'm sorry, I thought I explained, I can't eat this. I can't eat anything made of wheat." "Oh," she said, "That's not wheat." Every face at the table turned to look at her. Mouths open with an unspoken "Huh?" I said, "Yes, bread is made of wheat, buns are made of wheat. That's what the flour comes from." "I'll go check," she said. A few minutes later she comes back. "You're right! The cook and I both checked. The flour lists wheat as its main ingredient." One of the pastor's wives said, "This is why my children go to school in a differnt district." Anyway, Uncle Bob's, no, not good for CD. But the restaurant formerly known as "the Coffe Cup Ranch" is good. Also, Wed School was great today. The kids were all able to answer very well. I tested them by departing from the written questions in the book and asking them similar but different questions and how they could answer from Scripture. Very nicely done, all of you. And yes, Celebrex is nice. Monday I took most of the day off. I did some work on sermon prep and Wed School, but I've got a growing severe pain in my ribs on my right side. Johnny jumped on me while I was lying down on the floor on my left side. My arm was up and BOOM he came down on my ribs. I think that was Sat. night. Can't remember for sure. Tuesday I did quite a bit of office work, but my ribs are hurting more. I wonder if it's cracked or if Johnny knocked loose a gall stone or something. Mary took the kids out tonight for trick-or-treats. On sunday I told Oak Park that we couldn't get to very many houses. "Do the math" I said, "7 kids with treats per house. Last year we filled a 50 gallon trash can and visited only 6 homes." While I appreciate the generosity of the people around here, do you realize how much of a sugar high 50 galons of candy cause? Anyway, I played the hypocrite. 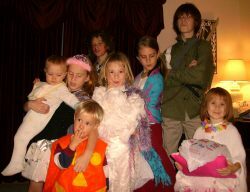 When kids came to our house, I loaded them up with a bunch of candy too. Since we don't get a whole big number of trick-or-treaters we give a lot away at a time. I suppose this is what everyone else does. And the kids are back. Guess what? Bucketfulls of candy. Mary had fun sorting: 5 lbs of mini snickers, 6 lbs of mini milkyway, 4 lbs of three muskateers, 2 lbs of mini butterfinger, wax lips, gooey toys, 7 snap on bracelets (those are kind of fun), 6 lbs of suckers..... well, the numbers are all made up, but it was a lot, you get the idea. Sore ribs and a sugar high saying good night.